In the right column of this blog you can find ads placed there automatically by Google. You only see two but there are actually ten. You can access the others with the up and down arrows. Ads also appear near the very bottom of the screen. Google tries to place ads that relate to the content of the blog. If you are displaying the entire blog, you can count on the fact to 80% or more of the ads will relate to silver somehow. Many will be for sellers of sterling silver. If you are looking to buy, click on these ads to check out what's available and at what price. If you are looking to sell, click on the same ads and look for information regarding how to sell to the advertiser. If you are displaying only a single blog entry, the ads may vary quite a bit. For example, if the article you are displaying talks about knives, you may see an ad for a seller of Bowie knives! So, for the best ad content, make sure you are displaying the entire blog. Google also provides a search tool in the right column. Searching from this blog has some predefined search criteria relating to silver. 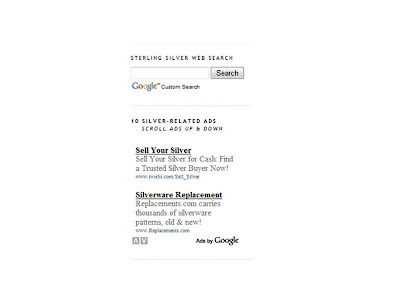 You'll find more ads among the displayed search results, also silver related. We encourage you to check out these ads if you are looking for anything related to silver.